In herbal medicine plants are used to prevent and cure disease and have been the basis for many modern pharmaceuticals, and plant based ingredients are still found in a large percentage of pharmaceuticals. A variety of plant material is used and includes stems, roots, bark, flowers, fruits, seeds, sap, leaves etc. Although the notion exists that all herbal medicine is safe, is must be kept in mind that herbal medicine can contain strong ingredients, and that herbal medicine, just like modern pharmaceuticals, should be used with care and as prescribed. Herbal medicine is used in Chinese traditional herbal medicine as well as Western herbology. 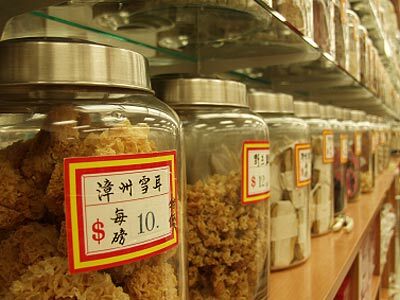 Chinese herbal medicine has been a formalized system of health care for thousands of years and Western herbology has also been around for some time. Western herbology normally group herbs together in the way it influences the body - such as anti-inflammatory, laxatives, diuretics, tonics, nervines etc, while Chinese herbal medicine normally divide their herbs into active characteristics such as heating, cooling, moisturizing, drying as well as taste - that being sweet, sour, salty, pungent and bitter. The use of herbs in maintaining health and treating disease has shown growth in the last couple of decades and is mainly due to the fact that people perceive normal pharmaceuticals as expensive and also because they feel that using herbs is a far more natural way and that there are fewer side effects, contra-indications or allergic reactions. Herbal medicines come in various forms and can be taken as infusions (teas), decoctions, pills, capsules, powder, liquid extracts or tinctures and can also be applied in the form of creams and lotions, compresses and poultices. Medicinal herbs can be very powerful, and there are also some toxic and carcinogenic herbs, so people wishing to use herbs as an alternative should consult a professional person - like a herbalist, Chinese herbal practitioner, Ayurvedic practitioner, herbal trained acupuncturist, naturopath or a normal medical practitioner who also uses herbs and herbal remedies.